The 25-year-old former Munster lock explains his decision to take time out of the professional game. 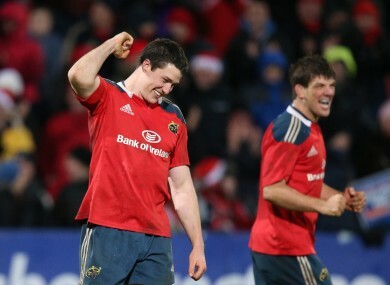 Nagle celebrates a Munster win over the Scarlets last year. IT IS A rare occurrence in professional rugby that a 25-year-old steps away from the game fully fit and with contract offers on the table. Indeed, some might struggle to understand such a decision, but there is more to life than the oval ball. Ian Nagle announced his decision to take a break from rugby on Thursday, much to the disappointment of those who have long seen him as a lock of excellent ability and even greater potential. After three frustrating seasons of unfortunately-timed injuries and subsequent lack of exposure in senior games, the Buttevant native has relocated to Washington DC, where a new challenge awaits. Not that there weren’t opportunities to continue with rugby. In fairness to Frankie Sheahan [Nagle's agent], because I’d say it was a hard sell, I got offers in France, England, Ireland and New Zealand to play on, but the more I looked into the opportunities outside rugby, the more I got excited about them. “I just said I’d take the break. Funnily enough, at the moment I’m 100% fit and I think that’s a good way to come out and take a break,” continues Nagle. It could have worked out very differently had misfortune not repeatedly struck in terms of match fitness. Emerging Ireland and Wolfhounds international Nagle stresses that he would never “look to make excuses” but circumstances did conspire against him repeatedly and in a cruel manner. Having made his breakthrough in the 2010/11 season, which included that man of the match performance against Australia, Nagle’s career path looked like one that would move along a continuous upward curve. However, a shoulder injury during the following pre-season ruined his 2011/12 campaign and eventually led to surgery that kept him out until November of the 2012/13 season. Having fought back to the brink of late inclusion in Munster’s Heineken Cup squad as one of three ‘additional players’ ahead of the 2013 quarter-final against Harlequins, Nagle was agonisingly omitted due to injuries to backs Keith Earls and Luke O’Dea. The following summer Nagle looked at options elsewhere, but with Munster keen to hold onto him, he headed into the 2013/14 season with renewed optimism. The Ireland U19 and U20 cap was a starter for the second game of the season against Zebre, only to injure his foot after just 30 minutes and again fall down the pecking order while condemned to the sidelines. His loan stint at Newcastle at the tail end of last season led to a familiar story, just two appearances thanks to injury and the Falcons being forced to field English-eligible players. Some Irish rugby fans have questioned why Nagle did not move away from Munster in search of a club that offered less competition and more playing time, particularly when Northampton showed their interest in 2011. “At that point, I looked into it a bit, but my heart was in Munster. I did consider the idea, but only for a very brief period. I was really happy with the way things were going with Munster and I’m from Munster, which goes a long way towards a decision. Nagle says he loved his time with Munster, whom he played for from the age of 16 and right through the age grades. He is stepping away from the game with only fond memories. The immediate future revolves around working with the rapidly expanding Dayblink consultancy firm in Washington DC in the US, where lifelong friend Brendan Daly is already well established. Nagle has also been busy studying since arriving from Ireland recently, working towards the GMAT exams, an entrance exam which may earn him a place in a MBA programme in one of the city’s prestigious universities. The prospects of progress in a new field excite Nagle, and the mental skills that helped him achieve in rugby are likely to transfer neatly into further education and working in a firm that has grown from two employees to over 20 in less than a year. A return to professional rugby after a year out would be something previously unheard of, but such is Nagle’s skillset and ability that several clubs will be more than willing to speak to him in a year’s time. In the end, there were three or four clubs I would have considered. Three of those clubs said that if I wanted to consider coming back in a year’s time, I could talk to them. Email “Nagle excited about new adventure, but not closing door on rugby”. Feedback on “Nagle excited about new adventure, but not closing door on rugby”.